Maybe you just got married and would like your new spouse listed as part owner of your home. Or, it could be that you want the ownership of your property to go to your child in the event of your death. To make changes to your property's deed, you must execute a new document rather than simply adding a name to your existing deed. Procedures vary by state and altering ownership in your property can have repercussions, so it's wise to consult an attorney before adding anyone to your deed. To add a joint owner to your property dead, you'll first need to check your loan documents or call your lender to determine responsibilities and policies. Possibly enlisting the help of an attorney, you will prepare the new deed that lists the joint owner and mentions ownership interest, and then take it to get recorded at the county recorder's office. Review your mortgage documents or contact your lender before initiating the process to change your deed. If you transfer your interest in the property, or a share of it, to someone else without the lender's permission, it may exercise the loan's due-on-sale clause. Even if the person you're adding doesn't give you money for ownership in your property, the lender still may view the transfer of ownership as a sale and can demand payment in full. Depending on your financial situation, this issue may cause you to reconsider making the addition. If your mortgage contains a due upon sale clause, talk to your lender about adding someone to your deed. Some financial institutions give consent, allowing you to add another person to your property deed without requiring you pay off your loan. Obtain a blank quit claim deed form from an office supply store, attorney or title company. Fill in the recording information. This includes the names of the people listed as owners on the deed -- in this case, you and the person you're adding -- and your mailing address, the one to which you would like the recorded deed and tax documents mailed. Strike a line through any verbiage on the deed that does not apply to your circumstances. This may include information such as the statement that the transfer is forever, or that the property transfer extends to the second person's assigns. Add language to the deed specifying what percent of the property you and the person you are adding owns, if necessary. Otherwise, there is a presumption that the ownership interest will be equal. Spell out ownership percentages only if the parties involved are to share ownership in a split other than 50-50. Also specify the type of ownership each party will have. Unmarried people can own real estate together in one of two ways: joint tenants with rights of survivorship, or tenants in common. If you own the property as joint tenants with rights of survivorship and one of the owners dies, the entire property will pass to the other owner. However, if you own the property as tenants in common and one owner dies, that owner's interest in the property goes to his heirs, and the other owner only keeps whatever she had before the death. If you do not specify the type of ownership, the ownership will be presumed to be tenancy in common. Therefore, if you want to have survivorship rights, make sure the deed includes language stating that the ownership is as joint tenants with rights of survivorship. If you are transferring an interest to your spouse, many states have laws that automatically give you survivorship rights and also protect the property from your spouse's creditors. This is called tenancy by the entirety, and in states where property can be held this way, spouses who own real estate together generally own it as tenants by the entireties automatically. However, not every state has this type of ownership, and the application is different in every state. Take the deed to your county recorder's office to have it notarized and recorded. 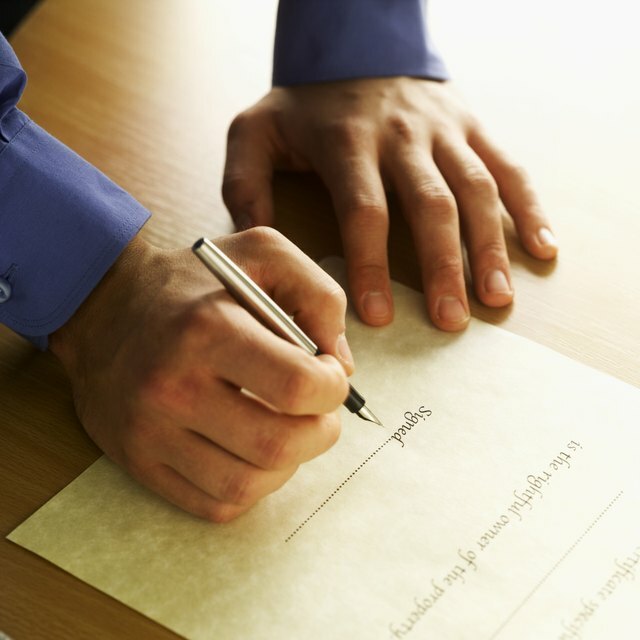 Procedures vary by state, so it's best to hold off signing the deed until you're in the presence of the notary at the recorder's office so that the signatures can be witnessed. The steps to add a person to a property deed as joint owner are the same if you own your home outright -- except you bypass the step that deals with reviewing your mortgage and contacting your lender. Use a typewriter or computer printer when filling in the information on the deed to ensure it is legible. Be aware that adding a person to your deed can cause you to lose property tax exemptions, based on how the deed is worded. This is a valid reason to have an attorney review a deed before you sign it and have it recorded. When you add a person to your deed, you're essentially giving them a gift of a percentage of your property. This can be an issue at tax time, as the Internal Revenue Service requires donors to pay gift taxes if they give away more than a certain amount in cash or property to one person during the year. FindLaw: What's the Difference Between Joint Tenants with Survivorship and Tenants in Common?